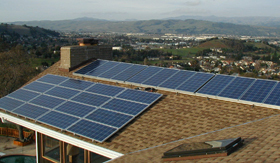 Land and Sea Solar has been doing solar in Santa Cruz county for over twenty years. When we started, our focus was in off-grid solar. As technology and incentives became available, we offered grid-intertie solar systems to utility based customers and that has become a large portion of our business. What sets us apart from the other solar companies besides having been around twice as long as most of them is that we are one of the only companies around that has thorough experience in all aspects of off-grid renewable energy and that remains a specialty niche for us. We also provide solar water heating systems, wind generation, and micro-hydro systems, as well as propane and diesel powered generator installations. We are based in Ben Lomond, Ca and primarily serve the Santa Cruz, Santa Clara, San Benito and Monterey counties although we occassionally work outside that area.